The story of Brunswick Hub, formerly known as Brunswick Healthy Living Centre began after the National census was conducted in 1991. The results showed the Brunswick area to be the most deprived ward in South Warwickshire and the second most deprived ward in the whole of Warwickshire. During the following 10 years, planning took place and ended up taking the form of the ‘Healthy Living Centre’. A facility in the local area to provide one-stop-shop, information and numerous support services. This was to become a local hub of resources, to not only benefit but to grow with the whole community. Regenesis was the lead body for the partnership that worked tirelessly on the funding application, the resultant capital build and the development of the facility. Through a local steering group the services were developed. Before the Healthy Living Centre was built there stood an old library and clinic that were regularly used. The original idea was to refurbish until the Brunswick Healthy Living Centre arrived on the scene. With wheels in motion, the old facilities were demolished to build Brunswick! Demolition began on 2nd December 2002, and was completed with Brunswick being opened on 3rd October 2003. In autumn 2008, Brunswick Healthy Living Centre closed its doors for refurbishment, this was not only a perfect opportunity to update the centres image but to also use the new layout and momentum to boost its range of services. New core funding was secured and a new business enterprise and employment suite was built in partnership with Warwick District Council. The refurbishment was completed and again the centre opened its doors on 13th July 2009. An official relaunch took place on 3rd October 2009, exactly 7 years after the original opening date. 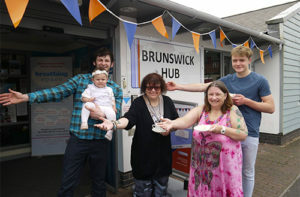 The name change to BHLC, Brunswick Hub happened in June 2015, with an Open Day organised to celebrate the name change on 25th July 2015.